What's in a Rotary District Governor's Visit? D9930 District Governor Graham Jull visits Taradale Rotary. Graham was introduced by President Keith as a member of Te Awamutu Rotary, a dentist and a colonel in the NZ Army for 30 years and a Past District Chair of the Youth Exchange Committee. Graham made a presentation to Assistant District Governor Ann Clarke for all the good work she does in Napier. Graham covered off the International Assembly in San Diego where he and Elizabeth joined 536 other DG Elect’s & 800 Rotary staff and spent a week preparing for his current role. Prior to that was also a training session hosted by Orlando Rotary in Florida including a visit to the Cape Canaveral Space Centre. Graham identified two critical turning points in Rotary in the last 50 years. In 1987 the US Supreme Court ruled that women could be accepted as members of any Rotary club in the world and in 2016 legislation was enacted allowing Rotary Clubs to be flexible in their meeting frequency and time. D9930 has 51 clubs and 38 of those hold regular weekly meetings. 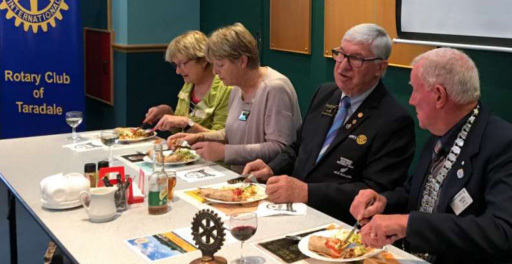 Thames Rotary Club holds a dinner on the first Tuesday of the month and has a breakfast meeting thereafter. 100 years of Rotary in NZ is celebrated in 2021. Last year D9930 contributed $239,000.00 to the Rotary Foundation, the third highest per capita contribution in the world. All of the NZ Districts were in the top 10. 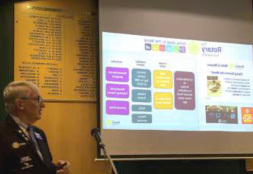 Graham covered off the District Website ably looked after by Max Patmoy and team and made a suggestion to Taradale Rotary that it has a teardrop type banner displayed outside the Hall when meetings are in progress. Graham also commented favourably on the very informative Taradale Rotary website. Polio Plus got a mention in that there are 19 new cases internationally this year and still work to be done in Afghanistan and Pakistan, Nigeria will be clear this year of Polio. The District Conference is being held in Hamilton on March 15 to 19 at the Claudelands Events Centre, the theme is “Island Time”. Graham’s parting words are that above all else, Rotary is about having fun and fellowship and many good things will come from that.